Fuel Cells – Day 2! 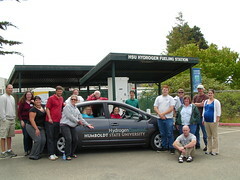 Participants at the hydrogen fueling station with the hydrogen powered car at Humboldt State University. We started the day reviewing the blogs from Monday and Tuesday. Beth introduced some books about design, Life Cycle Analysis and team development. She encouraged people to visit the curriculum developed for Building Big which can also be found on the DYF Teacher Resources page. Jim reviewed the questions from the Minute Papers from the day before. A bit of time was spent on explaining Gibbs Energy, which is the energy available to do for real work. People had good ideas for demonstrating how to teach middle school children about global climate change. CO2 and a lightbulb experiment and other hands on labs can be found at the Climate Studies Institute – need to contact Karina Junge – Ken and Becca know how to contact her. 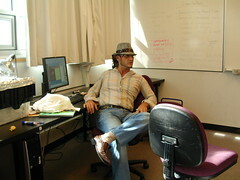 A way to incorporate the HyTEC curriculum into life sciences is to point out that the body runs on electricity (Ken). Another way to is point out how mitochondria use hydrogen and oxygen. It is also important to convey how science is fun. We learned that hydrogen runs $6-$8 a kg. Vince and Ken calculating efficiencies. 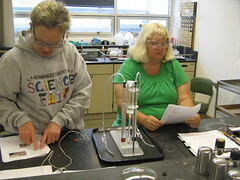 Participants moved over to Sci D 9 and worked on Lesson 5: calculating the efficiency of a fuel cell – electrolyzer system. Most people calculated 38% to 42% efficiency. The electrolyzer efficiency is about 8%. The overall efficiency of the system is about 3% due to the combination of the electrolyzer and the fuel cell efficiencies. Ellen and Sheryl compute the efficiency of their fuel cell and electrolyzer. One team had a fuel cell efficiency of 13 % and then via trouble shooting (realizing that hydrogen was being lost, even when the fuel cell did not have a load) they realized they had a broken valve. Participants appreciated an opportunity to trouble shoot the equipment. model with the HyTEC curriculum was not designed with efficiency in mind but rather to be inexpensive and practical for lab use. A couple teams had a hard time getting their fuel cells to start in the morning. Folks thought it was due to the membrane drying out. Once the systems were purged, they worked again. The fuel cells had been left out overnight. Folks were encouraged to store the fuel cells in a bag to keep them moist. Andrea inserting the data cable to determine pressure and temperature of the fuel tank. 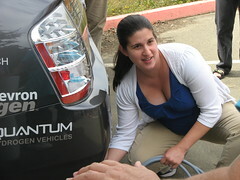 The hydrogen fueling station has a CA standard data cable to measure pressure and temp of tank before fueling. The station fills cars to 5000 psi. There are two large storage tanks at the station that each hold 6kg of hydrogen. Hydrogen comes from an electrolyzer is about 50% efficiency. It takes about 18 hours to generate hydrogen to fill the storage tanks after filling the tank on the fuel cell car. 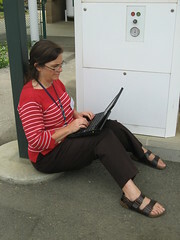 Beth blogging during the visit to the hydrogen fueling station. the compressor’s grossly oversized electric motor. Motors are typically quite efficient except when they are drastically oversized (and thereby underloaded). 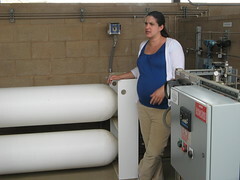 Andrea showing the storage tanks and compressor. The electrolyzer at the HSU fueling station is about 50% efficient. But Andrea has found that the electrolyzer is not that efficient which is likely due to the ac-dc converter that it requires. There is a 7KW load for the electrolyzer that could not likely be met by PV panels on the roof of the fueling station because there is not enough roof area. We had a discussion about why most folks do not care about efficiency of electrolyzers and compressors as much as they care about reliability and cost. The HSU hydrogen station cost $678K to construct, including $253K for major equipment, $133K for balance of system, and $220K for labor. Jim notes that a larger station would likely experience economy of scale. On average the station uses about 100 kWh of electricity per kilogram of hydrogen produced (this accounts for the electrolyzer and compressor energy consumption, which is the majority of the energy demand). This means that we would use about 36 kWh/day to support our one hydrogen Prius driving 100 mi/week (Note: For comparison the average home in the US uses about 30 kWh/day, and the average CA household uses about 15 kWh/day. Jim knows households who, with reasonable effort, have gotten this number down to about 5 kWh/day.) If we covered the HSU hydrogen fueling station awnings with solar electric modules we could generate about 15 kWh/day, or 41% of the energy needs to run the car 100 mi/wk. It will not be possible to construct commercial scale hydrogen fueling stations that serve large quantities of cars and expect them to generate all of their power on-site using solar energy. We then visited the Environmental Resources Engineering department office and discussed the automatic lighting system. 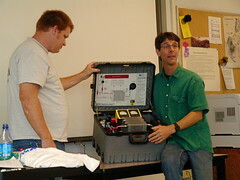 Dan examines the Stack-In-The-Box (SIB) as part of the fuel cell system design acitvity. What are important design criteria and constraints? What electrical load do we need to power or how much electrical power do we need to provide? What are two ways to increase fuel cell power output? How a fuel cell works and current practical uses for hydrogen. Evaluating the work of a fule cell and its practical application. Hydrogen fuel has some issues to work out to mak it widely available. Seeing the hydrogen car and the station details. 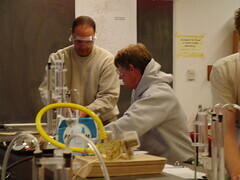 Performing activities in the lab before implementation in the classroom. More practice with the fuel cell. Lonny observes during fuel cell system design activity. What do I need to use Skype? What do I need to use USTREAM? How does the car work from start to running? I know how the fuel cell works, but its working within the car…. I’m unclear. Are there sensors to determine the purity of H2 and O2 gas produced or some other way of determining “how much” etc? I am OK on Gibbs. I have a limited familiarity with electricity. Could there be more materials to be used with the design activity such as a PowerPoint? Also, integrating similar calculations (using different units) before students are expected to synthesize …. Demos of labs and fuel cells could be created and podcasted or recorded and made available. Another great day. I can tell Jim loves his work. THANKS! HyTEC stuff could be prepared for lower grades as ready to go curriculum to reach more students. Please 3-hole punch handouts. I have misplaced several of mine. Again, interesting, fun, activities. Thanks for answering all our questions! It’s because we are very interested. We loved it! Could you bring a calendar in so we can sign up for you to come out to our school? Great job. Really liked the reality of using hydrogen. Interesting stuff today. Car goes “weeeeee”!